No party is complete without an abundant amount of balloons! 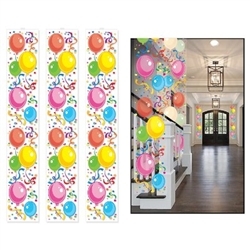 The Balloon Party Panels are perfect for setting a colorful scene at your party or event! No matter what the theme or occasion is, they will transform any room wherever you hang them! They make it quick and easy so you don’t have to blow up countless balloons. The variety of colorful balloons are sure to catch your guest's attention and add the perfect pop of color! Made of thin clear plastic. Measures 12 inches wide and 6 feet long. Contains three (3) panels per package.